Ginger with her 9 year-old adopted mustang, Dollar (from Wyoming), her trick riding partner. 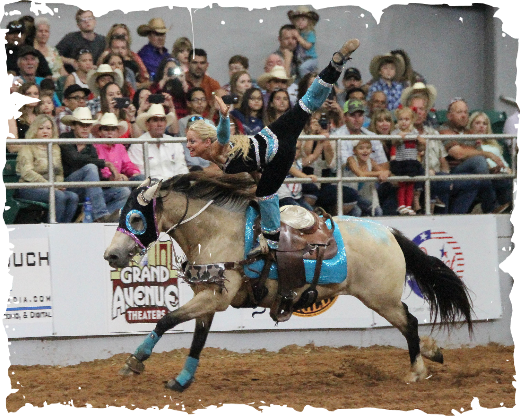 Ginger Duke, along with her amazing horses, brings the "Wild West" back to life with beauty, courage, speed, personality and daring horsemanship. Ginger is a professional trick rider that has performed world wide for the last 8 years and has been a PRCA card holder since 2006. Ginger Duke also performs with the female trick riding team, Dynamite Dames. Ginger is a high caliber individual who is setting the bar for today's Trick Riders. Many of her tricks are performed only by men. Her thoughts on that, "If they can do it, I can do it... and probably a little better." You will find professionalism, excellence, precision, speed, daring and thrilling excitement with each performance. 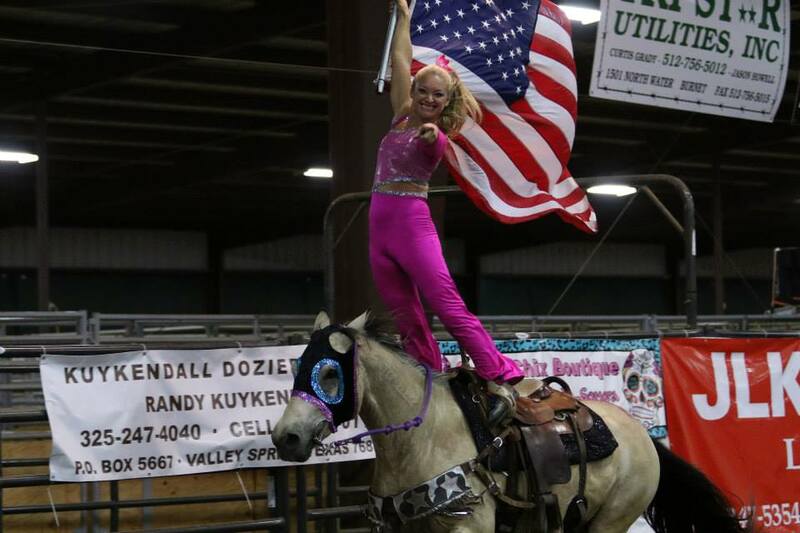 With over 1,000 performances at Professional Rodeos and other venues through out the United States and Abroad she has the crowd on their feet screaming with excitement. At the age of three Ginger's family recognized advanced levels of balance and dexterity in her. They quickly sought out to hone those abilities through the sport of gymnastics. She learned dynamic body positioning, air awareness, and body control. In latter years, her gymnastics evolved into cheerleading. She cheered in high school as well on the collegiate level. In addition to her athletic upbringing, she always felt more comfortable on a horse then she did on the ground. Little did she know that the capabilities developed through gymnastics and cheerleading training could be combined with her passion for horses. The day I talked my friends into taking me to look at the wild mustangs during a Bureau of Land Management (BLM) event, was a day I would not realize, until later, how much my life would forever change. I had a passion for horses my entire life, but was never in a situation where my family could have one. My history with horses started when I bought my first horse when I was 20 years old. I few years later I heard about the Mustang Makeover events. I went to several Makeovers and I was very intrigued, but had such little experience in training. At that first BLM event that I attended, I decided to adopt a little mustang to test my skills before I dove straight into a competition. I adopted a 4 year-old dun gelding from Great Divide Basin, Wyoming. As I waited for them to get to my horse to load him, the lady in front of me was about to load hers. 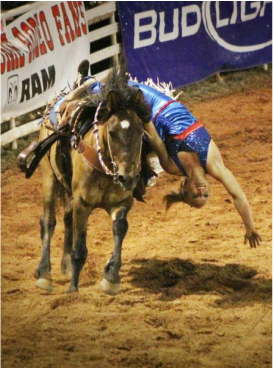 Her horse reared straight up over the chutes and attempted to jump out several times. All I could think was, "what in the heck did I just get myself into". Luckily, when it came time to load my horse, he walked right into the chutes, they haltered him, and he walked calmly into the trailer. That is where my journey began. That little horse was so wild when I got him home. I had never known anything with that kind of wildness about them, but at the same time so willing. I named my little mustang Dollar, for the only white spot that sat in the center of his head reminded me of a sand dollar. I am a trick rider, so this little guy hit the road with me as soon as he was gentle enough to halter, load and stand tied. It did not take long before I was riding him, and not much longer after that, I attempted trick riding on him. He did so well! I was so proud of him, and I was so proud of myself. I worked hard. He worked hard; our hard work was showing. I got so lucky that he was so willing, wanted to work and liked having a purpose and job. The trick riding just seemed to be the right fit for him. He enjoyed it and worked so consistently. His first rodeo was unexpected. We had a horse get injured and the group I was riding with asked if I thought he would be able to go out and perform. I was hesitant, but just asked that the announcer put a disclaimer out there for the audience. He was only 4 months out of the wild and I had not taken him into an arena that contained the energy that a rodeo puts off. After a discussion with the announcer, I trick rode on him that night. Proud, does not even come close to the feeling I got as we finished our first performance. He went in like a champ, he was slow as molasses, but took care of me. Nothing phased him, and he was completely focused on the task at hand. At that point I knew that I wanted to compete and that I was in love with these wild horses. Acquired from a BLM adoption, and about as wild as they come, Ginger wanted to take on the challenge of training a wild mustang before entering in an Extreme Mustang Makeover event. Within a few months, Dollar quickly became one of the most solid trick riding mounts. He is a favorite among the team for ground work, learning new tricks and a favorite of students who learn to trick ride and western riding. He is a great teacher for new trick riders and a solid mount for each of the girls during showtime. Dollar came from the Great Divide Basin, Wyoming. Ginger Duke trick riding on Dollar. Photo credit Gary Reynolds. People often ask me what the difference is when training a wild mustang to trick ride versus training a domestic horse to trick ride. You will probably be surprised, but there is no difference. People have often commented that hanging off of them is so unnatural for them, so surely there are extra steps in their training. Training is training. Every trainer has a final goal in mind with the horse they are working with. For me it is the exact same thing, except my final goal is to be able to hang off the side without my reins, giving complete control to the horse to carry me safely around the arena at a high rate of speed. My final goal is the same and I apply all of the same principles and techniques to both my wild and domestic horses. Does a wild one take longer? Sometimes. Just like any horse, they all have their own personalities and issues that you have to help guide them thru. 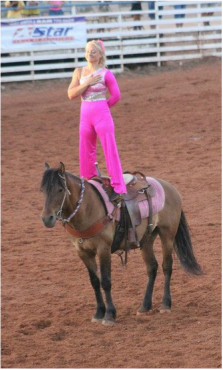 Ginger with Dollar at July 5, 2016 Rodeo during the National Anthem. Being involved in the mustang competitions has taken my training to a whole different level. The other trainers have always been so welcoming and helpful. I have gotten to travel around to different trainers for help and guidance and the things I learned and the knowledge that was given was incredible and appreciated. The other contestants and their families have become family. When I travel around the country trick riding, I can post on Facebook that I need a layover spot and where, and I will guarantee that 90% of the time it is a person that I know thru the Mustang Makeovers. I feel as though it is so hard to find a great group of honest hard working people, and I feel as though I have found that in my fellow mustang enthusiasts. Ginger Duke riding Been There, Dun That at the 2016 Mustang Magic Finals. Ginger placed 2nd and had the high selling horse at auction for $7000. I, now, mainly compete at the Mustang Magic that takes place during Fort Worth Stock Show and have also trained many mustangs for clients. I have competed in 6 Extreme Mustang Makeovers, keeping my Mustang Million gelding, Who, who is a 3 year old buckskin gelding from Great Divide Basin, Wyoming. I now trick ride and roman ride on him and Dollar. They have traveled the country with me, literally going from the east coast to the west coast and lots of places in between. I keep their brands shaved, and this attracts many curious people as to what the “tattoo” on their neck is. I get lots of great questions, and this helps me spread awareness. I feel as though they are great ambassadors for the mustangs representing the versatility of what they are capable of accomplishing. 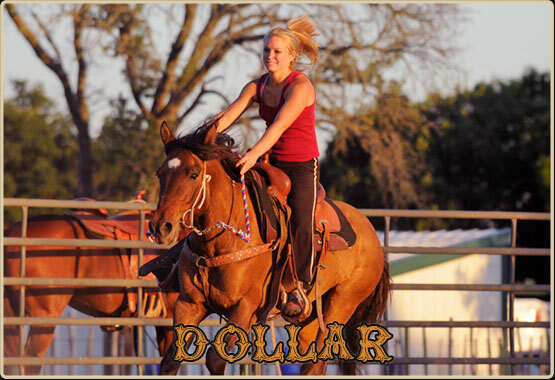 Dollar has helped train many young aspiring trick riders, he has carried several to trick riding championships. He is one of the most solid honest horses I have ever come across. He has also had a role in the movie “Cowgirls and Angels II, Dakotas Summer”. My mustangs have taken me places I thought I would never go, and I will be forever grateful for the dreams that they make come true for me and many other people on a daily basis. I get a lot of inquiries about people interested in competing in the Extreme Mustang Makeovers. I always encourage them to find guidance and go for it. The mustang family is big, and they all have big hearts. We are all willing to help each other reach our goals and dreams. The amount of knowledge and experience that is available within our group is unbelievable. I have many people visit where I train out of, and often have many people come watch when I bring a new mustang home to work with so they can get an idea of what to expect. I encourage this and welcome interested people, as do many other trainers. You will learn something no matter what and that is what we should always be doing. Learning and growing is what it is all about. These mustangs are a great way to do just that. 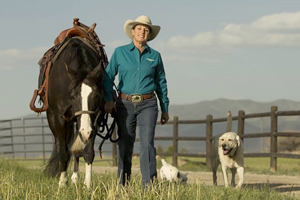 In the October Issue of Wild Heart Mustangs™ - Julie Goodnight, "Trust is a Two-Way Street"
Julie Goodnight is best known for her weekly RFD-TV show Horse Master, and for her no-nonsense training for riders of all disciplines. 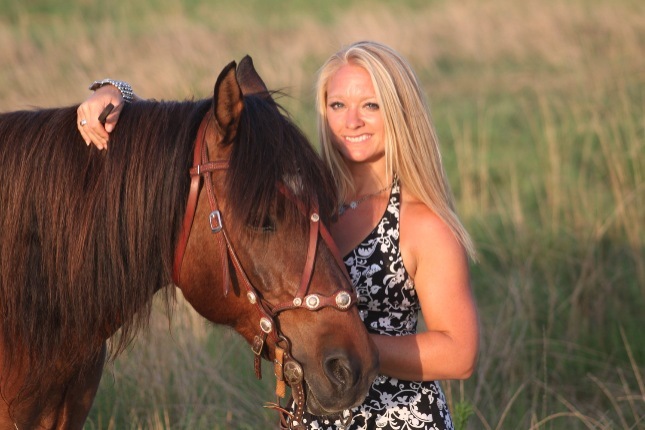 Her methods are grounded in natural horsemanship, classical riding, and understanding horse behavior. She teaches at clinics and expos everywhere and offers online education, how-to DVDs, and her own tack and training tools at JulieGoodnight.com. ​Hi! 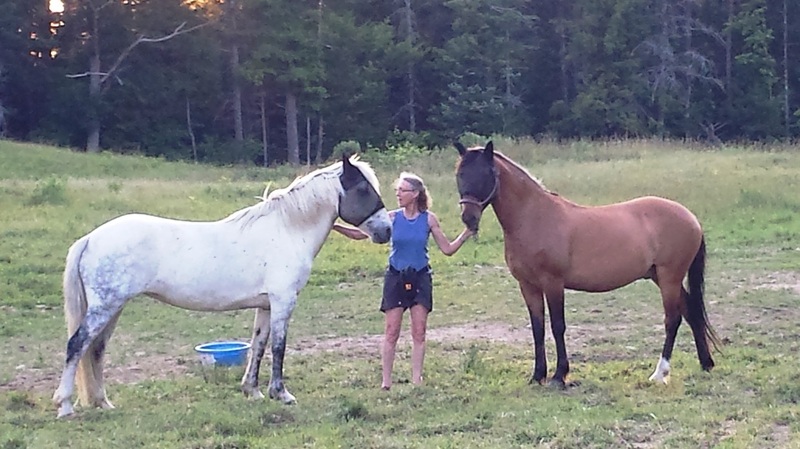 I just came across your site and thought I'd send you a pic of me and my two Wyoming mustangs. Gwen, white mare and Tyson, dun gelding. I love them and they love each other...and maybe they both like me. I got both of my mustangs from HorseTenders LLC in Greenfield, NH...they specialize in mustangs with issues related to neglect, abuse, malnutrition...HorseTenders.com for more info. I attended the 5 day horsemanship camp a couple years ago and have done several of the one day clinics as well. Oh, Kris and Nik Kokal, HorseTenders principals, are both featured in the documentary Wild Horse Wild Ride! Laurie G. from New Hampshire with Gwen (left) and Tyson (right). Both mustangs are originally from Wyoming.